What Is the Most Docile Breed of Hamster? In looking for any type of hamster, a docile temperament is an attractive quality, although it is important to remember that all animals are individuals, just like human beings. Despite the fact that hamsters vary greatly, Russian dwarf hamsters are often revered for their especially tame, gentle and calm behavioral patterns. Although Syrian hamsters are by far the most prevalent pet hamster species, they may not be the most docile. Although many Syrian hammies are indeed very tame, friendly and relaxed, the NetVet Veterinary Resources of Washington University website indicates that Russian dwarf hamsters may actually be calmer and more docile than the larger Syrian species. Remember, however, that not all hamsters are the same, whether Syrian, Russian dwarf, Chinese or any other variety. A specific Syrian hamster may have a softer disposition than another Russian dwarf, for example. In the hamster world, dwarf hamsters are also especially friendly amongst themselves. 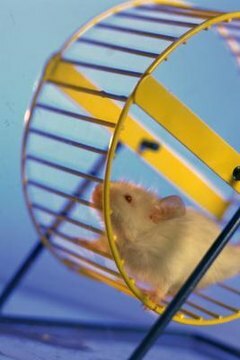 For instance, Syrian hamsters are extremely territorial animals and cannot live together successfully. In fact, pairing a couple of Syrian hamsters together may actually lead to some dangerous or fatal results. These guys just prefer to fly solo, plain and simple. At the other end of the spectrum, dwarf hamsters usually enjoy living in small groups or pairs -- the polar opposite of Syrians. Although Russian dwarf hamsters may be even easier to handle, Syrian hamsters, with the proper circumstances, are also usually docile. With some time and adjustment to an unfamiliar environment, a Syrian hamster can usually become a relaxed and safe furry companion. Regardless of what specific breed, never allow a child younger than 6 years old to come into direct contact with a hamster. If a child is above that age, it is absolutely necessary for an adult to constantly monitor any and all interactions -- no exceptions. Hamsters come in many breeds, and not all of them are appropriate as pets. Two such examples are Chinese hamsters and European hamsters, both of which possess rather aggressive and truculent behavioral patterns, according to The Merck Veterinary Manual. Before bringing a hamster into your home, always discuss the safety of the species with your veterinarian beforehand, especially if you live with any children. What Kind of Animals Can Chinese Water Dragons Live With? How Big Will a Roborovski Hamster Get?